Dikkon Eberhart, the son of Pulitzer Prize-winning poet Richard Eberhart, grew up surrounded by literary and artistic greatness. 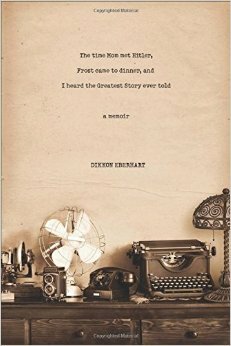 The Time Mom Met Hitler, Frost Came to Dinner, and I Heard the Greatest Story Ever Told is his memoir. This is an account of being the son of a famous poet and the many stories and social events of the inner circle of a famous father. The length of the events is a good collection of short stories. I enjoyed reading the way these family events took place and the influence of the famous people on Dikkon Eberhart. His exposure to a wide range of intellectuals is delightful, and he seems to be a careful observer as he shapes his own future. The influence of these famous people certainly helped shape his future as he follows his father's footsteps. The chapters are all believable and factual with personal touches. The writing style is easy to read, and the events are well described. I particularly enjoyed the fact that no matter how famous you become or who you know personally, the ultimate goal in life is finding God and repeating the four life changing sentences. The Time Mom Met Hitler, Frost Came to Dinner, and I Heard the Greatest Story Ever Told is beautifully told, and the life change and peace that comes with the most important decision one can make is a wonderful closing to this book. My overall rating of this book would be a 5 out of 5. I enjoyed the content and the story of finding an identity, as that applies to each and every one of us.